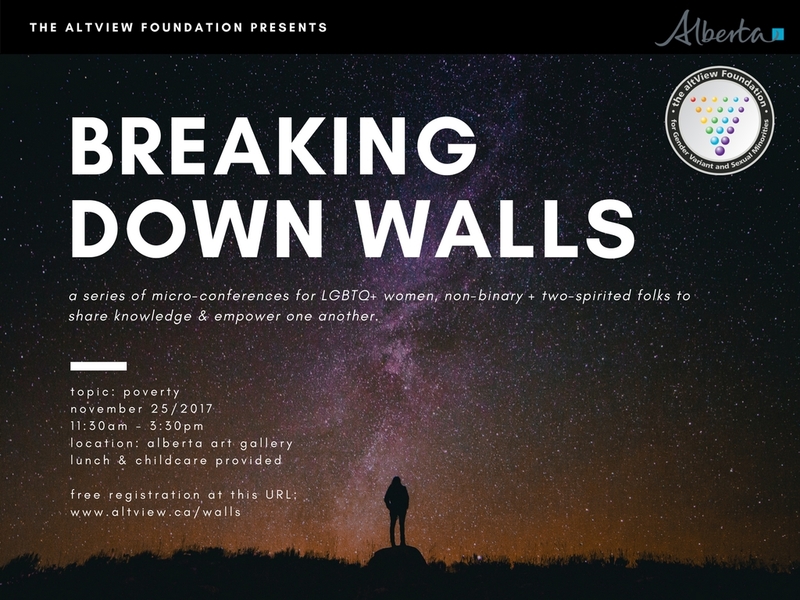 The altView Foundation and the Status of Women Alberta presents the Breaking Down Walls Conference: LBTQ+ Women, Non-Binary. and Two-Spirit Empowerment Project. These micro-conferences focus on the sharing of knowledge, empowerment, and the building of community for LBTQ+ women, non-binary, and Two-Spirited peoples from all walks of life. Each micro-conference consists of speakers from the community who will share their knowledge and experiences, followed by facilitated circle talks for everyone to discuss and share their stories. We invite all people from these identities to come together to create a safe environment to learn from one another. There are 4 micro-conferences in total, each with a different topic: leadership (October), poverty (November), gender-based violence (January), and health & wellness (February). These are micro-conferences; maximum of 25 participants. The location is accessible via the LRT. It is possible to enter the art gallery from the underground LRT station directly into the building without going outside. Transit tickets will be provided if needed. Lunch and refreshments provided (as well as for children). Have Accessibility, Childcare or Dietary Concerns? Previous : OUTlet is Back!!! Next : SupportiveParents.ca is coming!